"7 Men - And the Secret of Their Greatness"
Chuck Colson, who voluntarily served jail time for Watergate crimes when he did not have to. away that they might have kept. 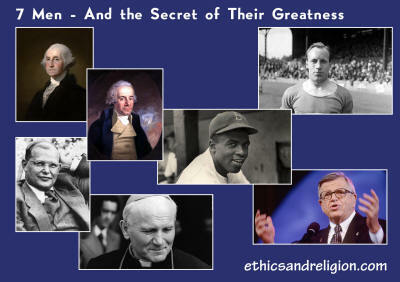 In this, the first of a two-part series, I will examine George Washington, William Wilberforce and Eric Liddell. We know George Washington as "the father of our country," after whom the nation's capital is named. However, he made his reputation as a military commander - first in the French & Indian War and then in the battle for American independence from Britain. Perhaps surprisingly, Washington, at age 21, claimed 300+ French casualties in one battle, when the real number was only 19. In 1755 the British sent General Edward Braddock with 1,400 men. The French and Indians killed 976 of them. However, Washington showed legendary courage in the battle. He "was unscathed though his hat and coat were riddled with bullet holes and two horses were shot from beneath him," according to biographer John Ferling. After the war, Washington married Martha Custis, a wealthy widow who he'd been courting. In the 1770 Boston Massacre British soldiers killed five colonists. In 1773, the British imposed the Tea Act, infuriating Americans who had no voice in Parliament. That sparked organizing the Continental Congress which decided to boycott all British-made goods. The British sent 1,000 soldiers to Boston - leading to battles at Lexington and Concord. The Congress decided to create a Continental Army, asking Washington to lead it. Six long years of fighting followed from Boston to Trenton, Valley Forge and Virginia. What's largely unreported is Washington's faith. His nephew, George Lewis, told a biographer that he "accidentally witnessed (the general's) private devotions in his library both morning and evening...in a kneeling position with a Bible open..."
Some urged the General to become king, which he rejected. In doing so, Washington "became the first famous military leader in the history of the world to win a war and then voluntarily step down instead of seizing and consolidating power," Metaxas writes. Perhaps you saw the 2007 movie, Amazing Grace which tells the story of William Wilberforce, elected to Parliament at age 20. At age 24 he and a friend, William Pitt, visited France, where they met Benjamin Franklin, 77, then the U.S. minister to France. Franklin said he was a lonely voice against slavery in America. At age 28 Wilberforce wrote 20 words in his 1787 diary that would genuinely alter the course of Western civilization: "God Almighty has set before me two Great Objects: the suppression of the Slave Trade and the Reformation of Manners." Wilberforce's friend Pitt was elected Prime Minister, a very important ally in his heroic efforts against the slave trade. In 1791 he received a letter from John Wesley, the great revivalist who at 87 was on his death bed, praising "your glorious enterprise in opposing that execrable villainy, which is the scandal of religion, of England, and of human nature...If God be for you, who can be against you?" It was a long spiritual battle, but Parliament voted to end the slave trade in 1807. In 1981 the British film Chariots of Fire won the Academy Award for Best Picture. It tells the story of Eric Liddell, the Scottish runner in the 1924 Olympics. His speed in the 100 meter race was outstanding. But the heats for the race were scheduled for Sunday, the Lord's Day. He refused to run. The British Olympic Committee was flabbergasted and outraged. Instead, he signed up for the 400 meter race. In the semi-final he came in second. He was also given the outside lane - the worst because he ran in front of opponents who he could not see. Before running, he was handed a Scripture: 'Him that honors me, I will honor." With God's help, he won. What motivated these great men was their faith.